These simple vinyl digits are easy to install and incredibly durable. For safety and convinience, clear house numbers are essential. Use these letters and numbers to mark virtually anything, in any environment. It's simple to apply your own mailbox numbers. Just peel and stick. Learn how to design the perfect custom sign to fit in your needs. Learn how to choose the right sign material. 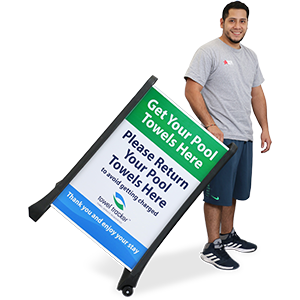 Using borders creatively can increase the visibility of your sign. Learn how in this quick video. Why using the right colors is important in making your sign more effective. Watch this video for tips on using the right font for your sign. Should I Add a Logo to My Sign? Adding a logo makes your sign more noticeable. Send us a rough sketch or let us design one for you. Should My Sign Be Metal or Plastic? Why a metal sign works the best and which kind of metal suits what purpose. Watch this video. Should I Install More Than One Sign? More than one sign is recommended to effectively send your message across. Learn why. Make a durable sign yourself. Use official 3M sign materials and die-cut letters. It's easy. Take a look! These signs are lightweight, easy to move, and they do great indoors or out. Coordinating signs are helpful for a lot of applications, and corrugated plastic is one of the most versatile materials availalble. Let us help ypou make the perfect, personalized sign. These durable digits are as easy as peel and stick! These reflective digits shine bright. And they're easy to install. A simple label could revolutionize your safety plan. These simple and effective magnetic digits may be just the solution you're looknig for. Laminated Mylar markers outlast weather and abuse. Several unique features make these Plastic Engraved Tags durable and highly popular. This quick video lists out the details. With all the reflectivity of a standard traffic sign, these digits are unmistakable. Different materials offer different strenghts of reflectivity. Here's some more information. Boy, do these signs shine bright - with just the light from street lights or headlights! Vinyl Cloth is a favorite in factory and warehouse settings - incredibly durable. Keep digits around in these ready-to-go boxes. 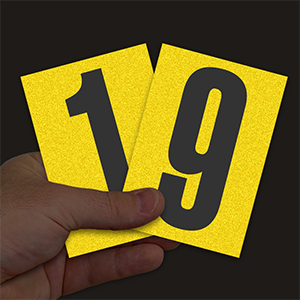 Apply Die-Cut Numbers & Letters in Minutes! Explore our self-aligning decals that align perfectly and require next to no effort to install! Watch the video. Reflective address signs will help you be found quickly in an emergency. This sidewalk sign is a real innovation. Lightweight yet sturdy, this sign looks great and is simple to customize. This is one-stop shopping for the best sidewalk sign in the industry. This is an overview of our wide variety of sidewalk signs. Just pop the letters in place, and you're all set. These magnetic label holders give you unlimited options. From wrist bands to keychains - we've got the pool passes you need. These road signs are as tough as they come, yet lightweight and simple to use. This sign is huge; you can't miss it. But, it's also really easy to customize and transport. This is a really popular and common type of sidewalk sign. Change the message as often as you like, and slide the board on this incredibly sturdy base. The sign swings in the breeze. It's eye-catching and will stand up to wind up to 40mph+. This simple and effective sidewalk sign makes it easy to change your message every month, every week, or every day! Which Type of Sign Face? 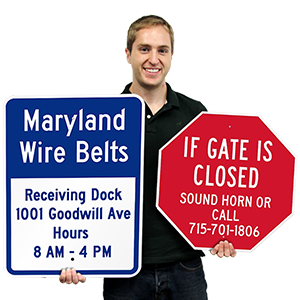 Our portable traffic control signs come in a variety of shapes and sizes. This video will help you choose the best one for your needs. Sign like this Children at Play sign are on the front edge of your traffic safety system.